Fundamentally AUD/USD has no business trading as strongly as it has. China devalued its currency, their trade balance shrank to its lowest level since the Lunar New Year and exports are down sharply. The strong AUD is a big problem for Australia’s economy is likely to drive future economic activity lower. Meanwhile stronger inflation and healthier consumer spending numbers from the U.S. should keep the U.S. dollar bid. Next week’s RBA minutes could be optimistic and employment numbers should be strong but Chinese GDP, industrial production and Retail Sales should be weak. The only explanation for the currency’s strength is carry and we don’t think that’s enough of a story especially with stocks poised for a deeper correction. We like selling AUD/USD between 0.7650 and 0.7700. Technically, AUD/USD has broken above the 20 and 50-day SMAs, which is a sign of strength for the currency but we believe the gains should be capped at 77 cents, an area where the currency pair found resistance at on multiple occasions in August and September. A reversal should take AUD/USD back down to 0.7550 and possibly even lower. Finally a Top in USD/CAD? 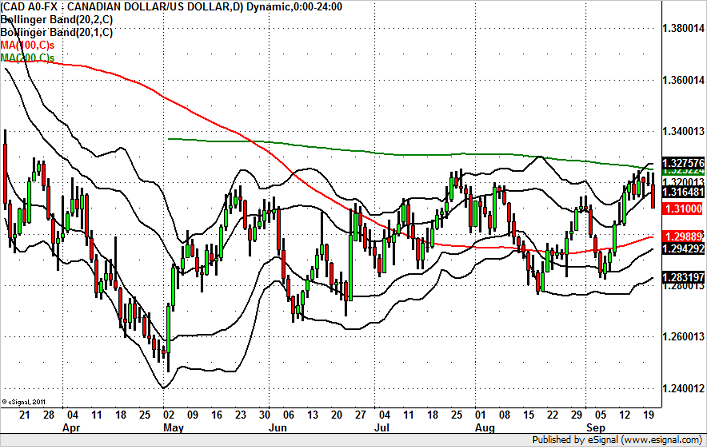 After days of consolidation we may finally be seeing a top in USD/CAD below the 200-day SMA. Today’s decline in largest in 10 trading days and the move has taken USD/CAD below the first standard deviation Bollinger Band. When that happens it usually turns into a multi-day move and in this case we are looking for USD/CAD to drop to at least 1.30, the 100-day SMA . On a fundamental basis, the more than 3% rise in oil prices and sell-off in the U.S. dollar is behind the move. While the greenback could find support soon, it may not be until USD/CAD drops to this key level. Oil prices have fallen for sometime and bounce is warranted whereas the market’s disappointment in the Fed could last for a few more days. 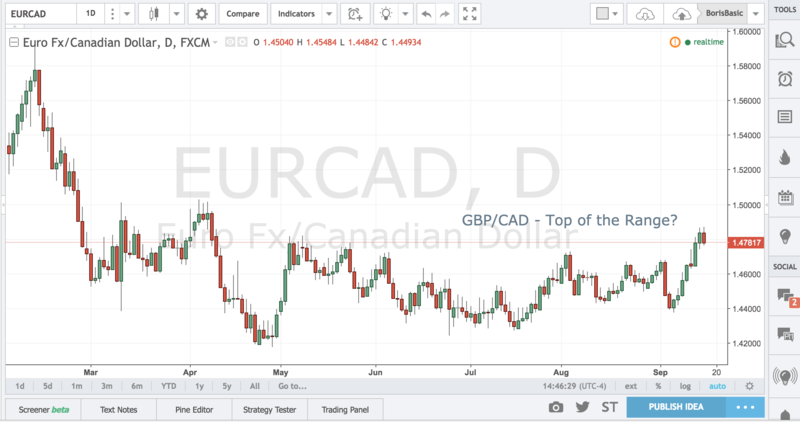 GBP/CAD – Top of the Range? The BoE meeting today ended with essentially a dud for sterling as the pair failed to hold its highs after the central bank admitted that economic conditions were better than anticipated after Brexit. The lingering sentiment in the market however, is that growth will become more problematic as the year progresses and UK becomes more serious in its negotiations to leave the European Union. The loonie on the other hand may be at the end of it decline as oil appears to be bottoming near the $44/bbl level. Another run towards the $50/bbl level could push USD/CAD towards 1.2800 and that in turn should send GBP/CAD lower as well. Technically GBP/CAD sees a triple top at the 1.7500 level that has been there most the year and as long as the pair respects that trendline the path of least resistance over the near term horizon is to the downside. EUR/USD – Top in Place? After an extended uptrend that has lasted for more than 3 weeks, the EUR/USD has finally closed below the first standard deviation Bollinger Band. On a technical basis, this signals that the currency pair has seen a top. EUR/USD has broken below the 23.6% Fibonacci retracement of the 2014 to 2015 decline and is below the 100- week SMA which signals potential for a deeper correction. Short term support comes in at the 100-day SMA near 1.1225 but we expect that level to be broken. 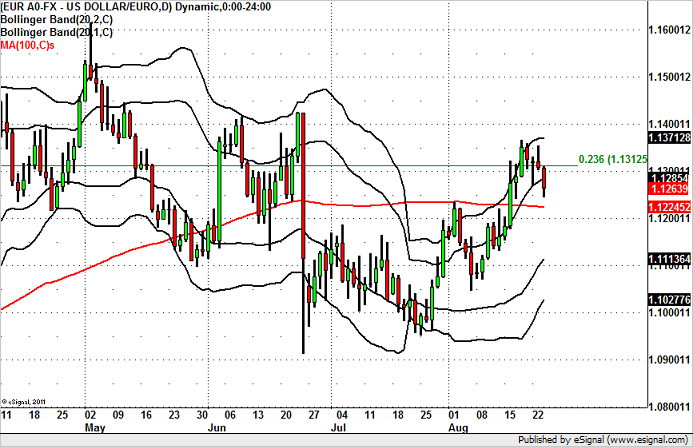 We only need to be worried about a significant reversal if EUR/USD exceeds the August high of 1.1370. Fundamentally, there were no revisions to second quarter German GDP numbers but exports and imports were slightly stronger. Earlier this week we learned that manufacturing and service sector activity in the Eurozone’s largest economy slowed during the month of August. This does not bode well for tomorrow’s IFO report. The deterioration in growth should lead to weaker business confidence, which should translate into further losses for EUR/USD. EURGBP – Top in Place? After a seemingly endless one way move as post-Brexit blues set in, the EURGBP may be finally putting in a meaningful top at the 8700 level. Despite generally better flash PMI data and despite fresh concerns that Theresa May may trigger article 50 sooner rather than later, the EURGBP pair has come off the highs and now looks to be targeting support. The move lower despite the generally supportive fundamental background is a clear sign of price exhaustion in the pair and suggests that more profit taking may be in store for the pair. The economic calendar is relatively light for the next few days with only IFO and UK 2nd revision GDP on the docket for the rest of the week, but any surprise in favor of UK could quickly push the EURGBP below the 8500 figure as the unwind continues. EUR/GBP climbed to a 3 year high today on the fear that this week’s U.K. economic reports will be ugly. We are generally concerned about the outlook for the U.K. economy but also cognizant of the risk of a top. The last time there was an uninterrupted rally in EUR/GBP as long as this one was in June 2011. When the pair topped after running 8 straight days without a correction, the sell-off took EUR/GBP from a high of 0.8975 to a low of 0.8277 in a matter of days. The reversal was almost as aggressive as the previous rally. 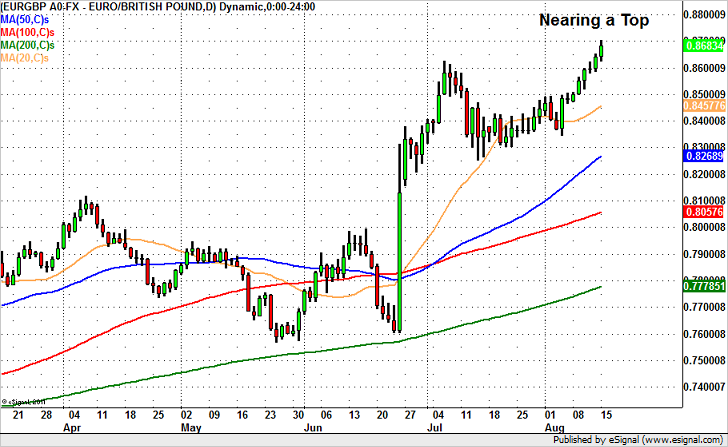 Short sterling positions are at record highs so the chance of a top is strong. Fundamentally, investors have every reason to be worried because these are the first set of post Brexit numbers and the fear is that they will be ugly. Between the GfK consumer confidence index, the RICS house price balance and today’s Rightmove report, the sting is being felt across the country. The government may have no plans to invoke Article 50 this year but the damage has been done and consequences are just beginning to appear. But weakness in sterling this week is not a given. We are confident that the labor data will be soft but the surprise increase in the BRC retail sales monitor suggests that discounting may have fueled stronger demand in July. At the same time, in their Quarterly Inflation Report, the Bank of England said a weaker pound could drive up inflation, which would be consistent with the smaller decline in shop prices reported by the British Retail Consortium. Any upside surprise could lead to a short squeeze in the pound. Technically, the next major resistance level of resistance for EUR/GBP is 0.8765, the July and August 2013 high. Near term support is at 86 cents. If it breaks, we expect a quick slide to 85 cents. The Reserve Bank of New Zealand cut interest rates today by 25bp. NZD/USD soared because the market hoped for a larger 50bp cut. However the RBNZ made it clear that they built in 60bp of easing into their projections which means they still have the intention to ease. 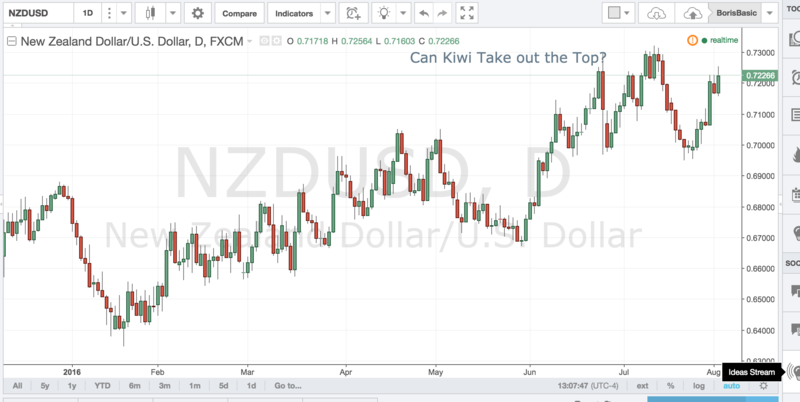 For this reason we believe that NZD/USD gains will be limited to 73 cents. 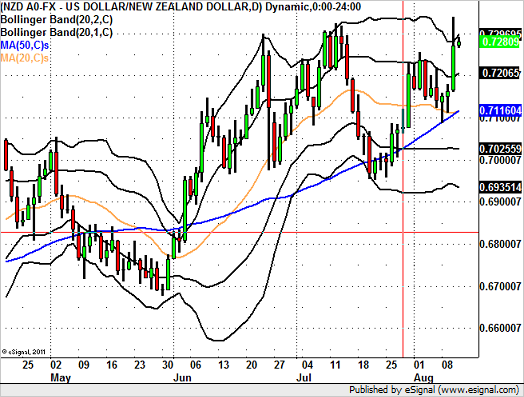 Technically there is a very clear triple top in NZDUSD around 73 cents. Today’s move took the pair as high as 0.7340. A correction should take NZD/USD back down to 72 cents. A move beyond today’s high would pave the way for test of the 100-month SMA at 0.7450. Can Kiwi Take out the Top? With a current yield of 2.25% the NZD/USD remains the best carry trade in the industrialized world. And although the RBNZ warned the market that it will cut rates later this month, the pair remains well bid as yield hungry investors continue to chase whatever return they can get. Although the RBNZ has been adamant about its easing bias, the New Zealand economy remains relatively buoyant and today’s Labor data with unemployment rate expected to stay at 5.7% would make it difficult for authorities in Auckland to argue that much more easing needs to be done. With NZD/USD within striking distance of yearly highs of .7300 the pair could challenge that level if the data proves better than projected. A break above the .7300 could open a run towards the key .7500 level while a disappointment should find support at the .7100 figure. 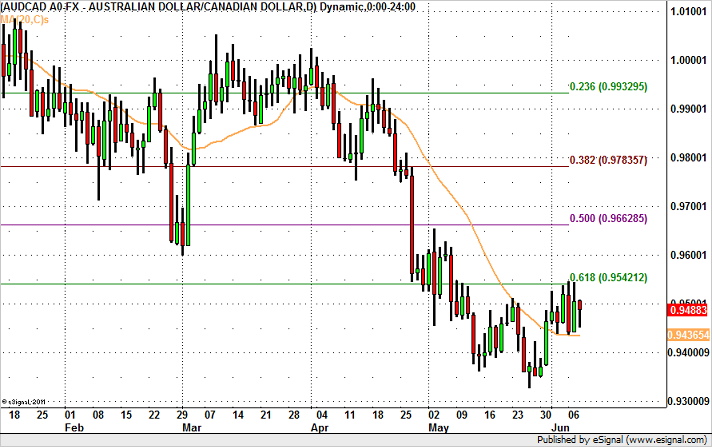 For the past week we’ve seen AUD/CAD consolidate between a relatively tight 0.9435 and 0.9535 trading range. This type of performance tends to happen when commodity currencies move in the same direction and / or the U.S. dollar dictates trading. While further range trading is possible, we also think that AUD/CAD is prime for an upside breakout. Fundamentally, the smaller decline in Chinese imports, rise in Chinese steel demand and less dovish RBA is positive for AUD. In contrast, the deterioration in Canadian manufacturing and housing market activity along with USD/CAD nearing oversold levels means that even if CAD rises further, its gains should AUD. Technically, AUD/CAD has done a great job of holding above the 20-day SMA at 0.9435. If this level is broken then a move to the May low near 0.9335 becomes likely. However if AUDCAD breaks above 0.9540, the 61.8% Fib retracement of the 2015 year end rally then 96 cents will be the target. Either way, we are at least looking for a move to the top of the range at 0.9535 before any of that happens. We have now seen the dollar fall approximately 600 pips against the Japanese Yen in just over week. Alarms should be ringing at the Ministry of Finance and Bank of Japan because the 5% appreciation spells big trouble for Japan’s businesses and economy. However, everything that we have heard from the Japanese government so far suggests that they are not ready to intervene in the foreign exchange market to lower the value of their currency. The last time the Bank of Japan intervened in the currency was in 2011 after the earthquake and tsunami (and that was coordinated). Since then we have seen USDJPY fall as low as 76 and average around 102.25 over the past 4 years. So Japan has and can tolerate a stronger yen although they have less flexibility with monetary and fiscal policy because extensive action has already been taken through these years. They could be waiting for the markets to capitulate first. They could also be looking into monetary stimulus rather than direct intervention to avoid being singled out for competitive devaluation of their currency at the G7 meeting in late May – because the host never wants to be embarrassed. On a fundamental basis, it is becoming clear that the BoJ could allow USD/JPY to fall to 105 and maybe even 100 before taking action. In early February they let USD/JPY fall close to 1100 pips before there was also indication of intervention. While it has not been confirmed on February 11th, after dropping to a low of 110.98, USD/JPY jumped 200 pips in 20 minutes -- price action that is indicative of intervention. USD/JPY still has 500 pips to go before this capitulation point, which would put the pair right between the 100 and 105 level. However we would be surprised if the BoJ let USD/JPY fall 1000 pips from its March 29th high of 113.80 without checking rates near 105. Potential Top in AUD/USD? Not Yet. The main focus tonight will be on the Australian dollar, which experienced its largest decline in more than a week. Softer retail sales numbers are to blame even though they were offset by a rise in job ads and building approvals. Aside from the trade balance and PMI services report, the Reserve Bank delivers its latest monetary policy decision this evening. No one expects the RBA to cut interest rates but there’s uncertainty around their comfort with recent moves in the currency. In the past, the RBA has said they prefer to see AUD/USD trading closer to 65 cents and has described it as overvalued near current levels but more recently we haven’t heard any specific concerns. Based on the table below, there’s been slightly more improvement than deterioration in Australian’s economy since the last monetary policy meeting with notable upticks in Australian and Chinese manufacturing activity that signal limited damage from a strong AUD. If the RBA makes no specific mention of wanting to see the Australian dollar lower, AUD will most likely recover its losses but if they express renewed concern about currency fluctuations, it could mark a top for the high flying currency. 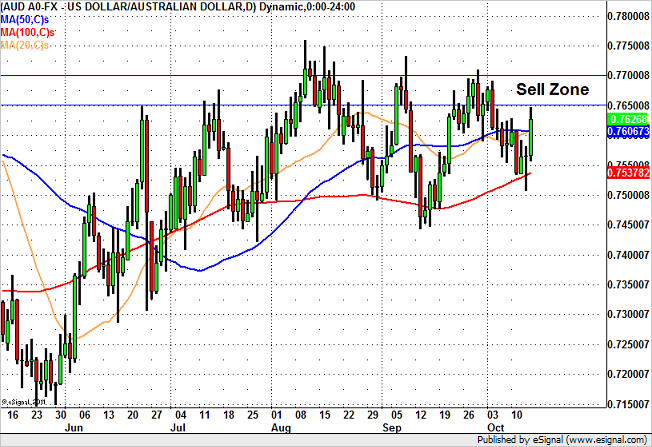 Technically the uptrend in AUD/USD remains intact as long as the currency pair holds above 74 cents. However a drop below 76 opens the door for a smooth slide to 75 cents. 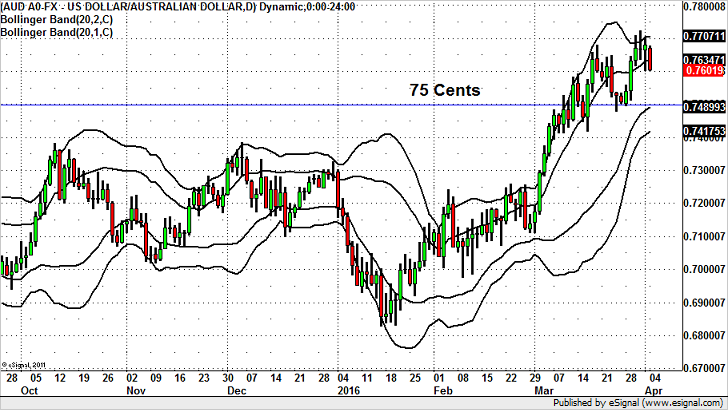 If AUD/USD holds 76 cents, then a retest of the 9 month high of 0.7722 is likely. Euro – Pullback or Top? The focus of the currency market will turn to the euro next week. The German IFO and ZEW surveys are scheduled for release along with Eurozone PMIs. When the European Central Bank last met, President Draghi said he doesn’t see the need for a further reduction in interest rates. Next week’s economic reports will go a long way in shaping market expectations for additional easing. If the numbers are strong, EUR/USD will extend its rise because the data will validate a steady stance in future meetings. However if the data weak, the overstretched euro could slip one to two cents. With that in mind we are weary of picking a top in euro or any of the major currencies because they are still trading near multi-year lows. EUR/USD is up 8 cents from its 2015 low but down 36 cents from its 5-year high. So from a historical price perspective, there’s plenty of room for it to rise. When trends get going in the forex market, it requires a major unanticipated catalyst to alter the moves and unless commodity prices suddenly crash or the Bank of Japan intervenes in a very big way, there’s nothing significant enough on next week’s calendar to spark a turn in market sentiment. Volatility is also very low with the VIX falling to its weakest levels since November -- low volatility is positive for risk appetite. Technically after the strong gains enjoyed between Tuesday and Thursday, the EUR/USD retraced to end the day lower on Friday. For the time being the magnitude of the correction represents nothing more than a pullback within a broader uptrend as long as EUR/USD holds above its former breakout point of 1.1050. This week’s rally puts the 2016 high of 1.1376 in sight. If that level is tested and broken the next stop should be 1.15.